So…you want an adorable flag tee for your kids, but don’t want to spend a lot of time or money? I’ve got the perfect answer! 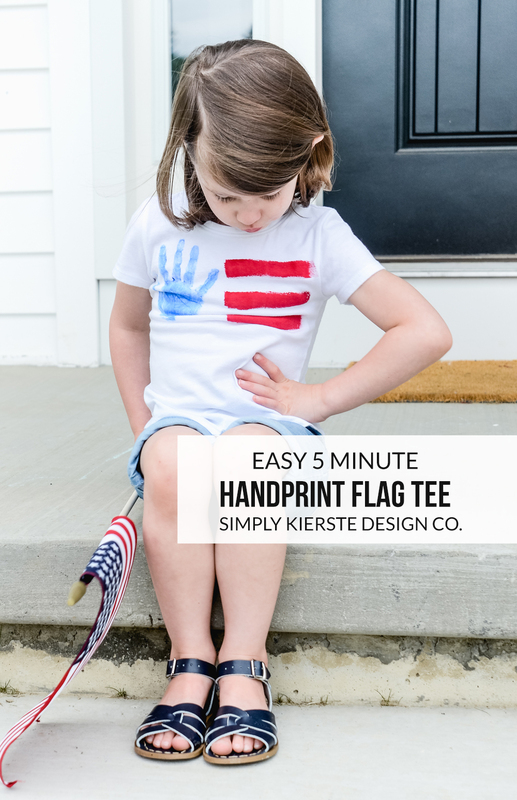 This super cute 4th of July Handprint Flag Tee literally takes less than 5 minutes to make, and has all the red, white & blue goodness you’re looking for. Best of all, it features the cutest handprint ever, and ends up being a keepsake too. 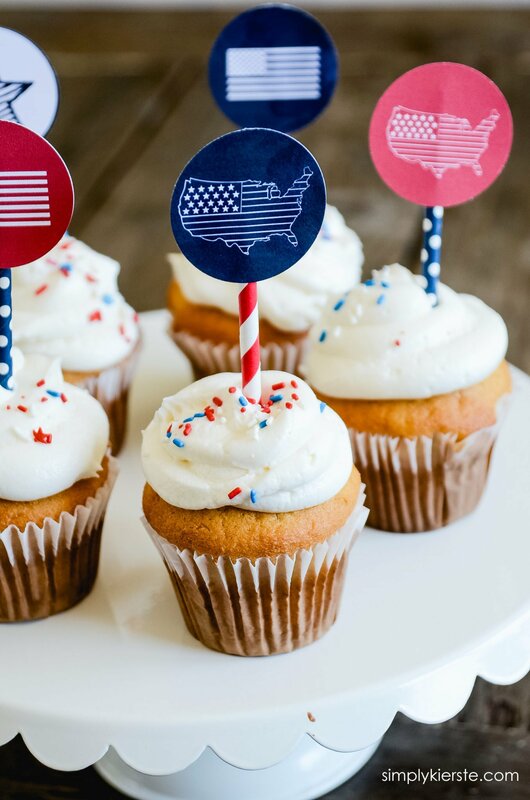 It’s SO quick, SO easy, and SO cute…you’re going to love it! I absolutely love it! 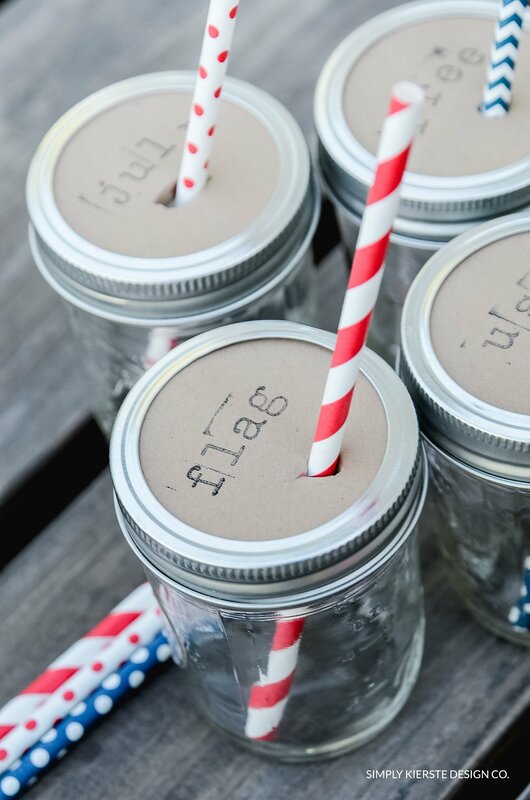 It’s perfect for all of your 4th of July celebrations, BBQs, parades, and firework shows, and you don’t need any special tools to make them. Just a little fabric paint, paintbrush, and a handprint! I decided just to do the stripes right next to the handprint, but you can certainly keep adding them–two full stripes underneath the handprint–if you want to. I like it like this, but that’s one of the pluses for this project…you can really make it your own! I just used a tee shirt from her closet that was just starting to grow out of, and I already had the fabric paint, so this was a totally free project for me–I love when that happens! Lay out the tee shirt on a solid surface, then place a piece of wax paper or cardboard (I like cereal boxes) in between the front and back so that paint doesn’t bleed through. Paint the bottom of the hand with blue paint–get a pretty good coat, not too thin, but not too thick. Place the hand with fingers slightly apart on the left hand side of the tee shirt, near the top. Press the fingers and hand down gently to get a good imprint. Remove the hand, and wash well! Use your foam brush or paint brush to add red stripes next to the flag, leaving the same width as the brush in between each stripe. You can add stripes underneath the handprint if you wish, stretching from the edge of the handprint to the farthest end of the other red stripes. That’s it! You’ve got an adorable Handprint Flag Tee! You can find even more HERE!!! Love this idea but how do you wash the shirt? Just follow the directions on the fabric paint you choose! :) Usually it’s wash as usual–I turn mine inside out first. Love all your ideas. I retired from our Maine VA hospital so I wore my patriotic Ts a LOT year round. I start around Memorial Day and go into July now! As I wore navy blue uniform pants for years, it was a great combo. Your little girl is adorable and a great model! We made tie dye T shirts the last day of Sunday school; bot the Ts when they were 2.50 and used the coupon on a LARGE dye kit at AC Moore. I like to have a stash of Ts ahead so when I find transfers, I am ready to roll! Thank you so much, Kathy! I love that you get to wear patriotic tees so much–that’s perfect for working at the VA Hospital. It sounds like the tie dye shirts were a hit, and you got such a bargain! I love that! !